Click on images to see larger versions displayed in lightbox. I remember as a kid my parents would let me shoot the final few photos on a roll occasionally. I remember taking hours planning out what I wanted to shoot. I also remember the days of disposable cameras. Oh how I went through those. So what has sparked this sudden emergence into the 35mm format again, you ask? I will tell you, good sir and ma'am. My parents have had extra rolls of film laying around the house for years, so I thought I might help clean up the place a little. I'm pretty excited about shooting film again. I love the slower pace of shooting and being a lot more methodical about composing shots. Also I love not being able to chimp! For those of you who haven't heard the term chimping, here's the definition. Not being able to check my photos as I take them just adds another layer of suspense to photography. Who doesn't love getting film developed and being shocked to see how many times your thumb is in the frame. In all honesty though I love the patience that comes with 35mm film. Some of the film set up next to the Nikon EM. One of the two 35mm SLR's I'll be shooting. 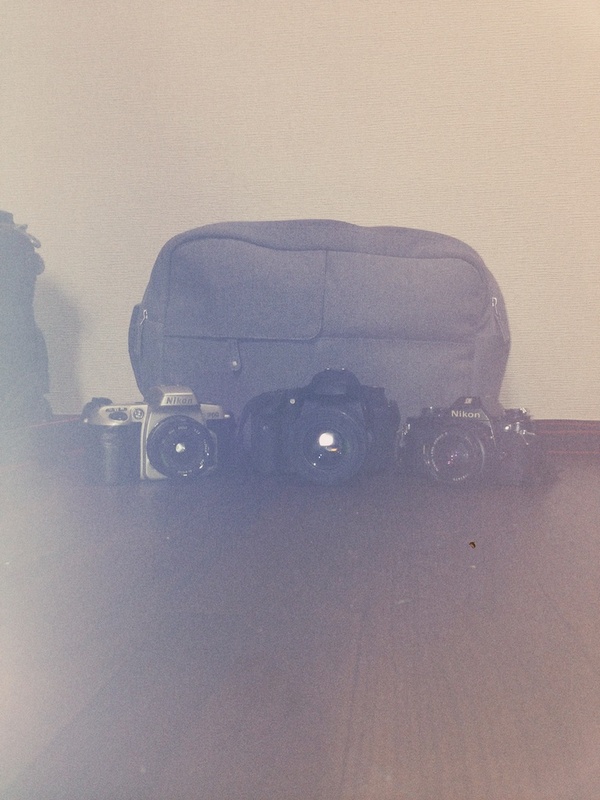 I'm planning on going down to Kyoto and doing some street photography with all of these old new toys. So what are my new old toys, you ask again? I'll be shooting on a Nikon EM with a Nikon E Series 50mm 1.8 lens and a Nikon F60 with a Koburn 28mm 2.8 Lens. I have some 400 B&W film in the EM, and some Super HGV 400 Fuji Color film. All the film is expired though so who knows how they will develop, it could lead to some cool photos. I'll also bring my Canon 7D along just in case. I'll try not to be tempted by the ways of chimping. In celebration of shooting film again I've taken a few photos with my iPhone using VSCOcam. If you haven't heard VSCO, they recreate old film for the digital age with presets for different photo editing software. They also have a pretty sweet iPhone app. So if you want to get some cool film effects on your phone, go get yourself VSCOcam! It's free and comes with a few filters, but you can always buy more if need be. VSCO is an awesome company though, and I am taken their design style. They also have a fairly new photo portfolio called Grid which is really rad. I got my code recently so you can check out my iPhone photography up there. Just go to daniellevy.vsco.co to see all my VSCO goodness! From left to right ; Nikon F60 with a 28mm 2.8 lens, Canon 7D with a 35mm 1.4 lens, Nikon EM with a 50mm 1.8 lens. Lets get ARTSY! I got this washed out effect by using the flash on the iPhone and putting a tissue over the flash to diffuse it a tad. Also gave it this blown out effect. Thanks for reading and I'll try to post some of the film shots whenever they get developed.